If you're looking for a tough, small 4WD racing buggy that's the perfect size for your garden or driveway, the Ion XB is going to be just the ticket! This pint-size buggy is laden with plenty of features that put it at the head of its class: 4WD, shaft drivetrain with ball bearings, resilient suspension parts, oil-filled shocks and a suite of electronics that includes a 2.4GHz radio system, powerful 370 motor and 800mAh NiMH battery. 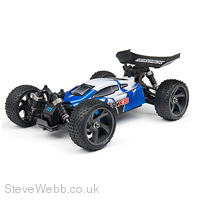 The Ion XB is the way to go for 1/18th scale buggy fun and performance!